Not one of the better entries in the Dark Shadows canon, but interesting and entertaining enough. The author really creates that foreboding gothic atmosphere and feeling into the books quite well and for that alone they are worth reading.The book summary was somewhat misleading - though David and Amy were 'possessed' by a phantom, this wasn't the sole subject, but more as an afterthought while the story really focused on a phantom pirate and his buried gold in the swamp on the property and the psychic in search of it. I know, right, how far can that be from the kid-possessing thing? The possessed child motif has been used in many horror classics, notably Henry James's "Turn of the Screw." 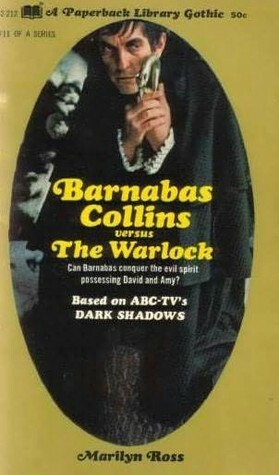 TV's Dark Shadows shamelessly plagiarized James in 1969, allowing little David Collins and his playmate Amy to be taken over by sinister spirit Quentin Collins. And here, in Dan ("Marilyn") Ross's book, we have the same story retold only in a different way. Here the possessing spirit is one Asaph Clay, a long-dead warlock. He has a grudge against the Collins family and expresses his rage through David Collins and nine-year-old visitor Amy Jennings. The children's pranks become increasingly diabolical, much to the concern of their governess Maggie Evans. There's a seance, held at the great house on Widow's Hill. There's a body found on the Collinwood beach. There are "manifestations" of Asaph Clay himself. Yet it is implied that while the haunting of the children may be real, someone else---a living person---may be faking SOME of the ghostly appearances...Suspicion falls on Barnabas Collins who must clear his own name. And the Barnabas-Maggie romance is resumed, with Maggie staunchly defending her vampire hero. I like this little book, silly though it is. It captures the eerie atmosphere of the TV show, and that's the most that one can expect from a Dark Shadows book. This is a really good story in the series. It starts with the legend of a pirate who buried his treasure in the swamp that is near Collinwood. A Dr. Bremmer claims to be an expert in the paranormal and holds seances in the house. His interest in the gold, though, is overwhelming. Then there's a problem with the supposed spirit of Asaph Clay and his hate for Phineas Collins and the Collins family.Add to that David and Amy claiming someone is forcing them to behave very badly. There's also Maggie's declared love for Barnabas, a strange hippie, a variety of physical attacks and a police Chief who seems to want to arrest Barnabas. Hare, Barnabas' servant, plays a role and a skull also figures into the entire deal.Maggie nearly dies several times plus there's also a long-standing love affairs that figures into all of this.There's also reports of various young women being attacked, having no memory afterwards but marks on their necks. Plus there's also a death on the beach.A lot goes on in this volume and it's really good. What do you do when you have a lot of story but write to a formula, all your books having twelve chapters of nearly exact length? Well, apparently you start with your story "already in progress!" The story starts with the children, David and Amy, already acting like they've been possessed by some spirit. Soon after Cousin Nina and her elderly husband arrive and the mysteries at Collinwood deepen. The story was fun and, for all his writing failings, Ross can set a mood well. However, what a rushed ending! It was if he said, 'By God, I'm not going over 157 pages no matter what' and just summed up the ending in a paragraph or two. This one was difficult to enjoy. It had a Scooby-Doo ending, and the ending didn't answer all the mysteries (including the primary one of who was influencing the kids). Elizabeth and Maggie were insipidly stupid and refusing to believe any evidence put in front of them. Wow. This book is really kooky. Characters behave in ways that make no sense. The relationship to the TV show is tenuous. Bizarre fun for the Dark Shadows fan.